Boston CC were beaten in the final of the Albion Cup on Thursday night. The Mayflower men were forced to begin with just seven players at hosts Bracebridge Heath due to traffic issues. Bracebridge racked up 50 runs before the full team had arrived. Boston’s Jonny Cheer was caught out at 58 and after that the hosts began working through the visitors’ batsmen to claim victory. The competition also raised £500 fopr the Libcs & Notts Air Ambulance. 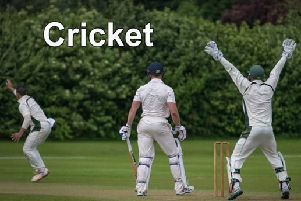 Boston Cricket Club’s Sunday XI were beaten at home by Fulbeck in the Lincoln and District League Premier Division. Ishan Jayaratne top-scored with 77 as the Mayflower men recorded 188 before being dismissed in the 37th over. Rowan Evans (23), Sam Holland (22) and Ben Troops (16) added god support. However, Fulbeck reached 190-5 to claim victory. Jayaratne (2-46), Wills Barker, Dan Fox and Troops took the wickets. Boston sit fifth in the table, with Fulbeck second.